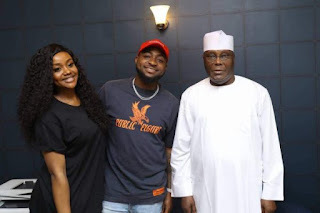 The presidential candidate of the Peoples Democratic Party(PDP), Alhaji Atiku Abubakar has pronounced Davido as the current and reigning king of Nigerian music. The former vice president revealed that Fela used to be his favourite musician during his days but since his demise, he has stuck with Davido. The elated singer then took to his twitter handle to react by saying ‘our incoming president knows wasupp’. Our incoming President knows wassup!!!! @atiku God Bless you sir ! !